Order, To Save A Life for only $3.50. This video is twenty minutes of information that someone contemplating an abortion needs to know. You can view the entire To Save A Life version of the film here. 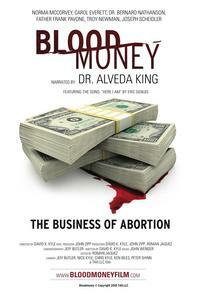 If you want the stark truth about the abortion industry in America, you need to get a copy of Bloodmoney. We can pontificate all day about how terrible abortion is. We can spend endless time and countless dollars into trying to get the laws changed. But when it comes to what you and I can do today, it’s all about helping young women in a crisis pregnancy make a better choice. And we are hearing readily that young women, when confronted with these truths, are doing exactly that. So if you want to help end abortion, you don’t have to run for office. You don’t have to donate thousands of dollars if you don’t have it. You don’t even have to go to marches and picket clinics if that doesn’t suit you. All you have to do is keep your eyes open, and when you come across a young woman in crisis, be there to listen, to support, and then tell her the truth. If you need to, give her a copy of Bloodmoney. That’s exactly what it’s for. Get your copy of Bloodmoney today, and help do your part to bring an end to this injustice.